Well, after Googling ever combination of Welsh, Author, Book, Reading, Challenge, etc, that I could think of, I can’t find a single reading challenge that focuses on my own family heritage (that’d be Welsh, if you didn’t guess it already 😉 ). So, what better to make my very first sponsored challenge than a Welsh one? So the first thing a challenge needs is a button, and I got that. It’s not the most incredibly creative, I suppose, and if anyone wants to make one for it, I’m open to it. Efydd bathodyn (bronze medal) – Read one to three Welsh-related books between now and December 31st, 2010 to receive a bronze medal. Arian bathodyn (silver medal) – Read four to six Welsh-related books by December 31st, 2010 for the silver medal rank. Aur bathodyn (gold medal) – Read seven or more Welsh-related books in before the end of 2010 and be a gold-medalist! 3. Post about it on your blog, leave a comment here to let me know and leave the link of reviews. I’d love to make a page and do a monthly update of what everyone’s doing. LOL.. though, everyone may just be me. You can list which books you plan to read, but you don’t have to. 2 and 3. Aberystwyth Mon Amour and Last Tango in Aberystwyth by Malcolm Pryce – Noir detective novels with cool cover art and fun titles that take place in the Welsh city Aberystwyth. He’s the best… and the only… Private Eye in town. I’m really looking forward to reading these. 4. A Writer’s House in Wales by Jan Morris – Journalist and National Geographic writer, Jan Morris, reflects on her home in Wales, her heritage and the history of the land. Another one that I’ve been looking forward to reading. 5. Under Milk Wood by Dylan Thomas – I don’t think a Welsh reading list could be complete without something by Dylan Thomas on it. Most people know the line “Do not go gentle into that good night,” which is a Thomas poem. Under Milk Wood is a play, and it’ll be new to me. Before coming across the play, I’d only thought Thomas had wrote poetry. 6. How Green Was My Valley by Richard Llewellyn – When I came across this treasure at the library sale last year, I actually broke out in a little victory dance. I have been wanting to read it for a long time, and NOW I could finally do it! Well… lol… can and actually DOING so are two different things. This book is one of the reasons for THIS challenge. It’s the story of a Welsh family in a coal town, how close they are as a family and community, and how the mining strike and later mechanization affected and fractured them forever. It’s a before and after view, and shows how we have to give up a lot to get modern conveniences and luxuries and who has to pay. Sometimes, even, we may want to take a second look at whether it’s worth the loss. 7. Here Be Dragons by Sharon Kay Penman – LOL, I got this book basically because of the name. It’s the first Penman’s Welsh Trilogy. Oddly enough, I generally run in terror from “historical fiction” stuff… but because it’s “Welsh”, well, that’s a different matter. 8. The Welsh Girl by Peter Ho Davies – I had planned on reading this for the World War II challenge last year, but never got to it. I’m hoping to get it read for sure this year. I read a few blog reviews of it late 2008-early 2009, and thought it sounded really good, but it just never migrated off the long-range TBR shelf. 9. On Black Hill by Bruce Chatwin – is a story of twin brothers living on a farm on the Welsh/English border. The book description says it gives a wonderful description of the loneliness of life in rural Wales. Hmm… sounds a bit like rural Appalachia, which makes sense, given quite a few of the Welsh immigrants (including my own family’s ancestors) came through that area. 10. The Journey Through Wales and The Description of Wales by Gerald of Wales – after my failure to get through The Conquest of Gaul, I’m not sure how I’ll fair with this one. Hopefully, the whole “war report” stuff Caesar wrote is why I couldn’t make it, and Gerald will be a wonderful historian to read. For some reason, though, I’m feeling a bit like Catherine Morland at the moment… Historians inflict torture on people by writing books. 11. A String In the Harp by Nancy Bond – YA fantasy that takes place in Wales. Okay, there’s my twelve. MAYBE, I’ll try for some more, but I don’t know if I’ll be able to fit much more into it. There’s more I’d like to read… like Sheepshagger by Niall Griffiths, that one looks like it’d make Palahniuk sick. And I’d love to know what other great Welsh books there are out there. I’m so excited to get reading! 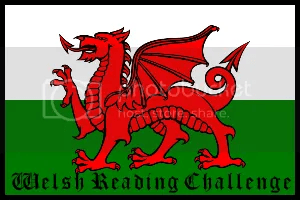 Update: The Welsh Reading Challenge now has it’s own blog. Click here and explore!